An ancient sanctuary dedicated to the god Mithra was excavated in Lucciana on east coast of Corsica. The site was excavated by France’s National Institute for Preventative Archaeology (INRAP) in advance of roadwork planned in the neighborhood. This is the first ever sanctuary discovered on the French island. A team of archaeologists sent to Corsica by the INRAP, started excavating the site back in November 2016 to make sure that no important archaeological ruins are hiding there, before the local authorities start digging. The remains of the ancient city of Colonia Mariana are within the municipal boundaries of Lucciana, but this specific area had not been excavated before. The team’s director, Philippe Chapon, suggests that this little Roman town reached its prime during the 3rd and 4th centuries AD, when it flourished as a commercial harbor and became a significant “meeting point” for maritime trade between the people of Mediterranean. After three months of hard work at the site, the archaeologists revealed that they have unearthed and identified a worship room and its antechamber. According to Chapon the finds appear to have been part of a religious sanctuary dedicated the Indo-Iranian deity Mithra, "This is a very rare and exciting find. It is the first time we find evidence that Mithraism was practised in Corsica. There are only a dozen similar sites known in all of France, the last one having been excavated near the city of Angers in 2010", he told IBTimes UK . Chapon and his team also uncovered several relics, including three oil lamps, and three broken pieces of marble structure depicting a scene from the religion's mythology: the sacrifice of a bull by Mithra. Other artifacts that were unearthed included a female head made of marble, bronze bells, and pottery. Mithra was a Zoroastrian deity who was in charge of covenants and oaths. He was the god of light, purity, goodness, truth, and occupied an important place in the faith of the ancient Aryans. The name of this god was adapted into Greek as Mithras. There are various opinions on the spread of the Mithra cult , but the most reliable one is the first written protocol about the Mithraic cult from 14th century BC. In the treaty text signed between the powerful kingdom of Mitanni (Mitanni was situated in the North of Armenian Plateau) of king Shativaza (unknown-1350 BC), and the Hittite king of Suppiluliuma (1380-1346 BC) we can see the name of Mithra. So the Mithraic cult was mentioned in Persian cuneiform inscriptions and in the Indian Vedic texts since the 4th century BC. As a result of the religious revolution of Ardashir II, the Sassanid King of Persia in 395 AD, the cults of Mithra and Anahita, the Iranian goddess, were imported to Persia and combined with Zoroastrianism. In the 1st century BC the cult of Mithra penetrated into Rome, and in the 3rd century AD this religion had become international and spread from India to the Black Sea, from the Balkans to Britain and Spain. 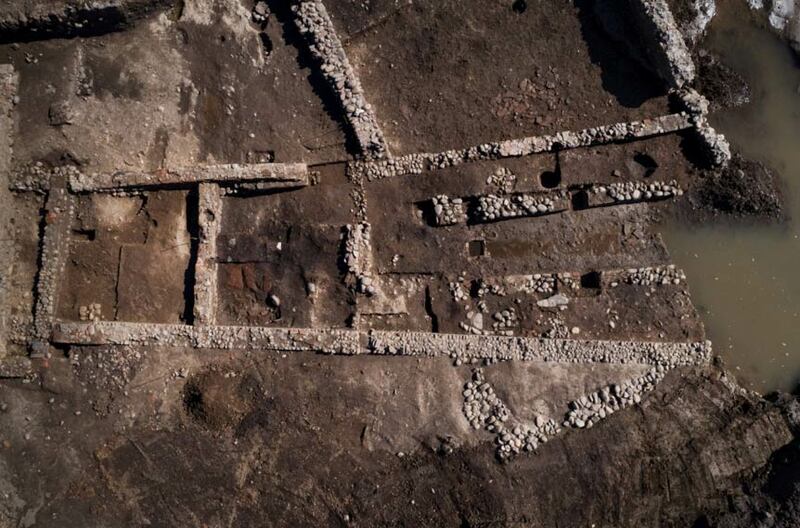 Now there are more than four hundred Mithraic temple ruins throughout Europe, with the newly found structure in Corsica being added to the long list. The fact that Mithraism entered the western world around the same time as Christianity caused tension and hostility between the followers of the two religions. Unfortunately, we don’t know much about this ancient religion, due to the fact that there are not any saved documents describing Mithraism. What we know for sure, however, is that when Emperor Theodosius I proclaimed Christianity as the official religion of the Byzantine Empire in 392, he showed no mercy to paganists and violently forbad the practice of any other religion, including Mithraism. Maybe that explains why some of the artifacts found in the Corsica sanctuary bear clear signs of damage which was sustained during antiquity. Even though that is just a theory, it is possible that such religious temples were viciously attacked and damaged by Christian worshippers just like what happened with numerous ancient Greek and Roman religious temples and sanctuaries . Any violence and takeover of property might have been done under the veil of Christianity but they were most decidedly opportunists, and not followers of Jesus, of whom there were many at the time. That which is depicted here is not Mithras but Aries and the Bull represents Taurus.The representation is that of the decline of the Age of Taurus and the coming of the following Age of Aries. The Age of Taurus brought about the Egyptian civilization and the Age of Aries brought about the subsequent Roman civilization . Mars, is the naturally associated, planet of Aries, which, in the myths, rules Blood, Red (cap), Knives and Slaying, amongst other things. All of the above can be confirmed by Internet searches. The Phrygian cap is a telling sign that this represented Mithra. But, yes, the slaying of the bull, represented, in part,Taurus's demise. Astrological ages average 2150 years, and the transition from one astrological age to another, the cusp, takes several decades on either side of the divide. During those times, there occurs world-wide shifts in consciousness. Yet, the image it can mean so much more than that, alone.The symbol of a ritual of sacrifice is very potent, signifying an opening of the veil between a vibrant life and the unknown future, death. However, the motives, or intent of the sacrifice can vary considerably, from a scapegoat, who becomes imbued with the short-comings and faults of a person or people that is to be transcended, to a payment, up-front, of life force for divine energies to return and bless the person or people. Please inform me (convince me) why the Phrygian cap is a telling sign that this is representative of Mithras. I say that this is current dogma and that there is little evidence to prove it. The Phyrgian cap (or any red, pointed hat) belongs specifically to no one but is a ‘symbol’ of knowing/esoteric knowledge etc. It is used as a symbol through many fairytales and myths. it is not without recognition that the Seven Dwarfs, Santa’s little helpers, Pixies and Garden Gnomes are depicted (often) with similar caps/hats. Even Wikipedia (hmm!) says “Such images predate the earliest surviving literary references to the cap.” So there you have it.